Veterans of Roadburn, slated for Freak Valley 2014 and self-sufficient with Stump handling the recording at his own Crystal Clear Sound in Dallas, Wo Fat push their jams farther than they’ve ever gone before on these five tracks. 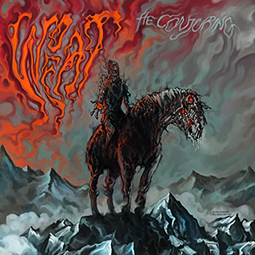 Topped off with a mastering job from Nolan Brett at Stump’s studio and an otherworldly cover courtesy of Alexander Von Wieding, the beast that Wo Fat’s tectonic riffage calls to earth has never seemed more real or more alive than it does on The Conjuring. Recorded and mixed by Kent Stump at Crystal Clear Sound, Dallas, Tejas. Mastered by Nolan Brett at Crystal Clear Sound. Album artwork, logo design and song titles typography art by Alexander Von Wieding, www.zeichentier.com. All songs written by K. Stump, M. Walter, T. Wilson.